SelfMadeCycling.com is a colaborative effort from Michael Anderson and Matthew Racine to bring Cyclists a free, intuitive, and practical way to log your training online. Using a journal to log your training is one of the best ways to look back at what made you feel better, and figure out why that made you feel better. 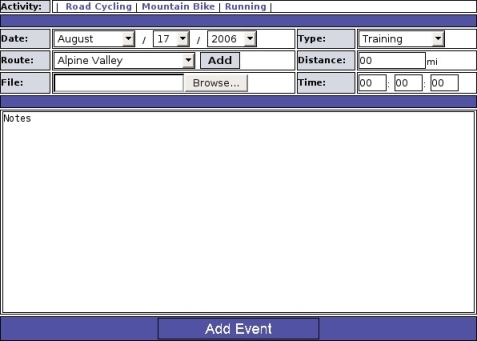 With the Self Made Cycling Training Manager you can log a wide range of information, including time, distance, route, and more. Plus with a notes section you can write down anything that happened, such as weather, who you rode with, things you might have seen, or how you felt. With all of this information being continuously logged, reviewing daily activities, comparing routes, and keeping track of what you are doing becomes amazingly easy, especially since we do all of the math for you when it comes to calculating monthly average speed, average distance, total distance, and total time. 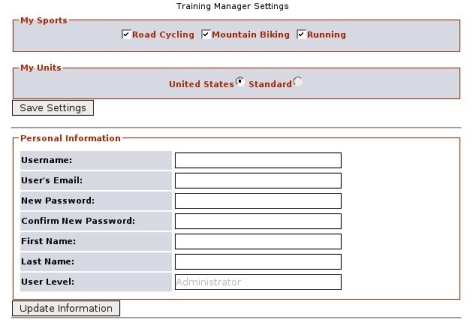 When you finish a training ride or race, the first thing to do is log the stats that you have recording with your cycling computer, or just from knowlege. All of the fields are optional, but filling them all out helps to make more of a complete experience. Possible fields are the date. The date field automatically picks today as the date for you, so if you enter your stats right away, that's the easiest part. The next section is the type of event you are recording. The possible values for this are Training and Competition. When you change the value to Competition a "Position" field becomes available, allowing you to remember how you placed during a competition. Another feature is the route feature. We all have our favorite routes that we take, and it's fun to compare these routes and see your fastest and slowest rides on the route, or even your average time for a certain route. 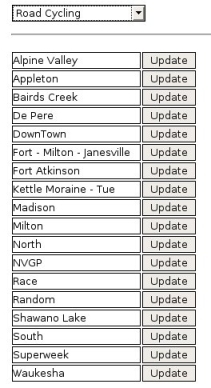 The routes are fully configurable and can even be changed in the "edit routes" section of the website. Two of the last three fields are pretty self explanatory. You have 'Distance' and 'Time', the essential parts of recording any training or competition event. The last field, 'File', is still a work in process. We, the developers, are still deciding how we would like to store your data. Eventually with this you will be able to upload and save heart rate monitor, SRM, and PowerTap Data. The data will then be associated with that day's event and will be easily viewable by just downloading the file again. 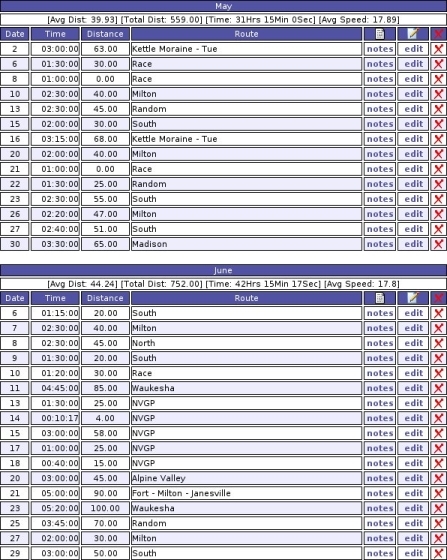 Viewing the records from your training and racing is the basis of this website. The records are sorted by by year then month, and sorted by the day of the month. If you have two entries for one day, it will show them in the order that you entered them. At the top of each month the up to date stats of the month are shown. These stats include Average Distance, Total Distance, Total Time, and Average Speed. Each entry had the ability to be fully edited, deleted, and reviewed. The notes for each event are kept in a seperate link that pops open for you, thus keeping the data clean and easy to read. Also, if you enter an event and realize that perhaps you have already entered that event, deleting an entry is just a few clicks away. Not everyone does the same sports. Some people like to just road ride, some people like to just mountain bike, some like to do both. With the settings panel, you can pick and choose what you want to use, and not what everyone else wants to use. When you first register you will be brought to the page. This step is crucial and the web site is basically useless without proper settings, in other words at least one sport selected. We've even included running for those out there that happen to like running. Soon the website will support the use of SI units. We realize that America is the odd group out when it comes to units of measurement, which is why we are doing out best to implement this feature. Your personal information is also easily updated from the settings panel, if your email changes, just change it here. You can also change your password, username, first name, and last name and you can view your level of access to the website.